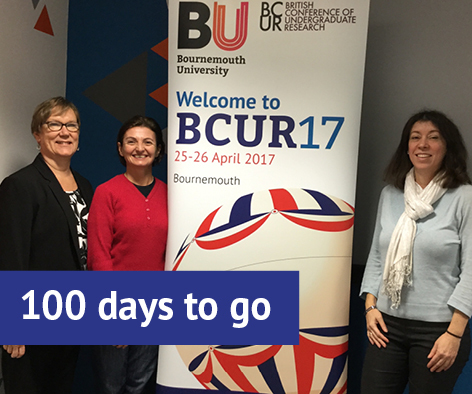 100 days from now, Bournemouth University will be hosting the prestigious British Conference of Undergraduate Research (BCUR). The annual event is an opportunity to celebrate the valuable research contribution of undergraduate students to a wide array of subjects and disciplines. Bournemouth University students have been involved in the British Conference of Undergraduate Research since the first event at the University of Central Lancashire in 2011. Each year, students gather to present their research through a combination of posters and oral presentations. Many have undertaken research projects as part of their dissertation or a placement. Professor Gail Thomas, Head of BU’s Centre for Excellence in Learning and the Chair of BCUR17 commented, “We’re delighted to be hosting this year’s BCUR and are greatly looking forward to welcoming students from across the country to Bournemouth this April. “Here at Bournemouth University, we strongly support the fusion of research, education and professional practice as we believe that each factor reinforces the other. It’s wonderful to see how many students have submitted abstracts to the conference, as it highlights the importance of research as part of a student’s educational journey. “Looking back, the entire experience from planning to reflection tested my professional skills which university life doesn’t normally expose you to. BCUR gave me an insight into the world of conferences, networking and communication. These are skills which now as a graduate I need to be confident in, internally and externally at work. “The thought of BCUR initially made me very apprehensive. It wasn’t until I started putting my presentation together that I realised my dissertation had become a comprehensive piece of work, which I was quite proud of, and putting it into a different format gave me a different perspective on it.